So begins T. S. Eliot’s haunting Ash Wednesday. It is a work of introspective scope, reflecting on the significance of his suffering and the orientation of his faith. Eliot is a modern poet. But his anguish is as ancient as it is thoroughly contemporary: a conflagration of passion and vice, grappling between the allurements of the world, her hopelessness, and the redemptive call of God. His cynicism bears all the marks of despair. It is visceral in its rebellion and honesty. Yet, it is tinged with a veiled light — the more potent sparks of grace that will not flicker into oblivion. Inspired by Dantesque visions of beatitude, and written as his marriage fell apart, Ash Wednesday remains a work of modern significance, though it hinges entirely on a preceding and undying tradition — a legacy of faith he knew well. The theme of hopelessness that runs throughout the six parts of the work hints to the long road Christians traverse towards purified belief. Ash Wednesday is a poem of pilgrimage; the story of a soul. No more clearly than in these rhymed aspirations, these tentative, often despairing words, do we realize that we exist to be molded by hope. We remember that, as we progress from ‘dust to dust’, the work of God — the redemptive work of His grace — remains the preeminent force within our lives. At the onset of Lent we are given a tangible reminder that, apart from God, we are but dust. Rooted in the understanding that we are fashioned from the dust of the earth, slowly, often painfully, we learn that apart from the life-giving breath of His creative love, we return to dust. Apart from His grace, we do not hope. We dare not hope. We cannot hope. We cannot arrive at true hope on our own. Hope requires the intricate interplay of grace and will through which God perfects our wounded nature. This is the difficult and probing purification that mysteriously transforms our weakness into His likeness. We have to desire it. We must grant the sculptor licence to reveal the glory of the stone-cold heart. Mercy stands as that lintel upon which the portal to hope newly opens. To seek mercy is to slowly learn to hope again. Mercy teaches us the depths of love. Mercy teaches how to forgive. Mercy teaches what love asks of us. Mercy teaches that the cost matters not. On the foundations of a love that does not count the cost, a love that is liberally lavished, we are elevated — brought there where the vista expands to encompass not just ourselves, but those who surround us in present exile. We are brought up from the depths of selfishness and the disgrace of pride. From this vantage point, we are set free to pray, to pray once more, to pray, perhaps, as we have never before prayed — to pray for the mercy we desire, and the courage to beseech it. The harsh temptation is to doubt mercy; to doubt that mercy changes us; to doubt that we can change. The exercises of Lenten penitence — its effects which mark us — help us remember that we have been changed once and for all in Baptism. We have been claimed, and deemed precious enough that the Son of God would die for love of us. If the burden of judgment seems heavy, it is because He bore the heavy burden of our sinfulness first. We share in His suffering, as we share in His glory. This is the meaning of sharing in divine life. This is the appeal of Lenten hope: a hope that is alive as it is crucified — flesh and blood bound on the beams of mercy, to open the doors to eternity. Lavished in this mercy, we are humbled — diminished in a salutary way — only to be vivified, only to realize that true life is to depend on His life. We are invited to rely on His grace, to set ourselves in that position of honest need, and so shatter once and for all the empty shell of self-reliance. All this is staked on the truth of a far more perfect love: He was the first offering, the first perfect sacrifice, the first to die that we might live. Here, is the first taste of freedom. Here, we rise from the ash-heap of wasted lives, and emerge from the darkness of incredulous denial. 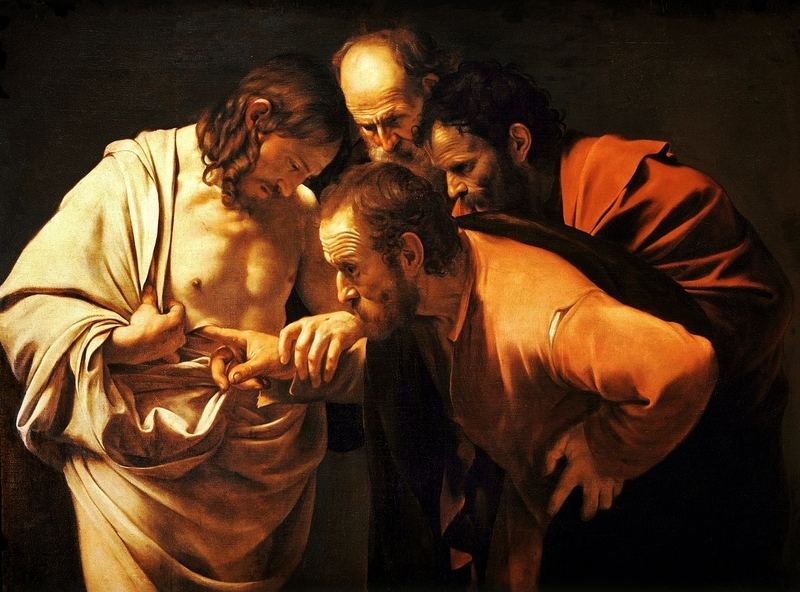 Here, at last, we find the strength to touch the hem of His garment, trusting again. Here, we are given the power to offer others the forgiveness we have ourselves received: the power to grant them freedom from past faults. Here, we enter into that largesse that is waiting for the opportunity to give itself eternally. Here, we behold anew the face of God. By His sacred wounds, we are healed.